Wind chill is a term commonly used by meteorologists in the colder months of the year. But when you see a wind chill of minus 20 degrees in your forecast, do you know what that truly means? You may also hear forecasters refer to this as the "feels-like" temperature because, essentially, the wind chill is how cold it actually feels on your skin when the wind is factored in. This is because the wind strips away the thin layer of warm air above your skin. The stronger the wind, the more heat lost from your body, and the colder it will feel. When the winds are light, it will feel closer to the actual air temperature. The blue-shaded areas represent the amount of time it takes to get frostbite at the corresponding wind chill temperatures. 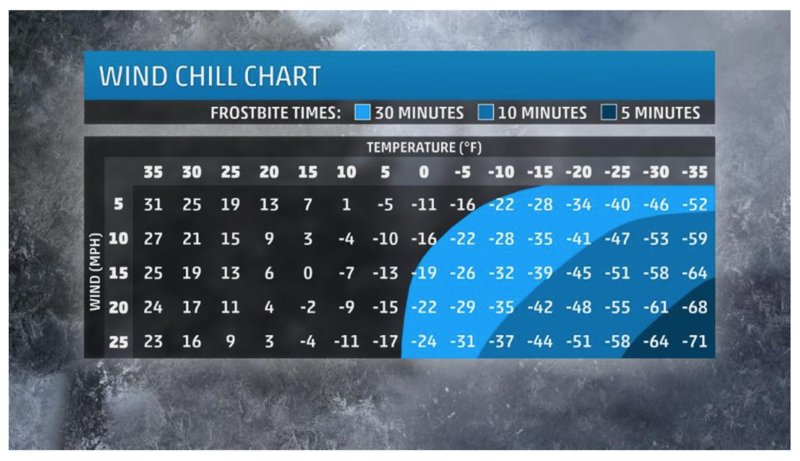 You can determine your wind chill temperature using the chart above. Find the value closest to the outside air temperature, then the value closest to the current wind speed. Your wind chill temperature is the value where the imaginary lines drawn from the air temperature and the wind intersect. The blue-shaded areas in the wind chill chart represent the amount of time it takes to get frostbite at the corresponding wind chill temperatures. For example, with an air temperature of minus 20 degrees and a wind speed of 15 mph, frostbite can occur in 10 minutes or less. MORE: When is the Coldest Time of the Year? Besides the wind chill feeling colder than the actual air temperature, it can pose dangerous risks to your health. The colder the wind chill, the higher the risk for developing frostbite or hypothermia. Hypothermia occurs when your core body temperature, normally around 98.6 degrees, drops below 95 degrees. MORE: What Happens When You Have Hypothermia? If your body temperature is 96 degrees or less, you feel cold and sluggish or are having trouble thinking clearly, the NWS says to see your doctor immediately or go to the nearest emergency room. "It's better to be overly cautious than to die of a disorder that does not have to be deadly." Frostbite occurs when body tissue freezes, such as your fingers, toes, ear lobes or the tip of your nose. In order to protect vital organs, your body cuts circulation to your extremities, including your feet, hands and nose, which eventually freeze. In order to avoid frostbite, the best thing to do is stay inside when it is bitterly cold. If you have to be outside, you should cover every part of your body, including your ears, nose, toes and fingers. You also want to keep your skin dry and stay out of the wind when possible. MORE: What's the Worst Winter Hazard? Be sure to stay hydrated by drinking plenty of fluids since hydration increases your blood's volume, which helps prevent frostbite. However, you want to avoid caffeine and alcohol. Caffeine constricts your blood vessels, which will prevent warming of your extremities. Alcohol reduces shivering, which your body does to keep you warm. First degree: The skin's surface is frozen, known as frostnip. Second degree: The skin may freeze and harden; blisters form in a day or two. Third degree: Muscles, tendons, nerves and blood vessels freeze. Fourth degree: Pain lasts for more than a few hours and skin may turn dark blue or black; gangrene is a real threat and will require amputation of extremities if it occurs.